Only one of three patent leather Air Jordan I retro, the White, Black, Varsity Red Air Jordan I (1) features the tradition Air Jordan I, but what makes it really unique is the use of patent leather at throughout the shoe. Patent leather hasn’t been used very often on Air Jordan models, but puts a new spin on the classic color combination and updates it to fit in with today’s look. The patent leather makes it much more modern and since its 2003 release, the patent leather Air Jordan I has yet to make its way back to store shelves. 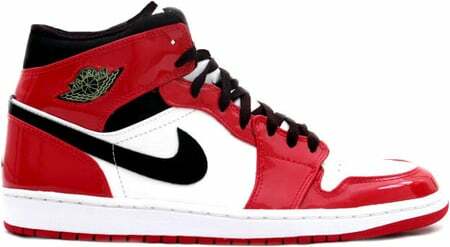 The Air Jordan 1 (I) Retro Patent Leather White Black Varsity Red was released on November 22nd, 2003 with a retail price of $100. This retro model is becoming harder and harder to find with its popularity at an all time high. Its price and popularity continue to go hand in hand, with re-selling price exceeding $250.